Is there a better alternative to Quick Convert? Is Quick Convert really the best app in MP3 category? Will Quick Convert work good on macOS 10.13.4? 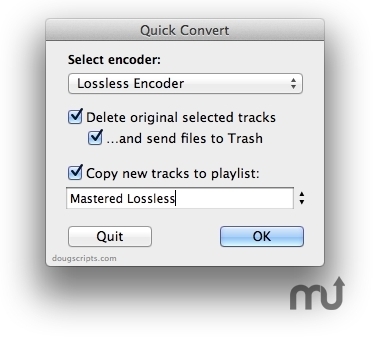 Quick Convert enables you to convert all or just the selected tracks of the selected Playlist using your choice of available iTunes encoders, restoring your Preferences-set encoder afterwards. Works with importing selected CD tracks, too. Version 3.1: Release notes were unavailable when this listing was updated. Quick Convert needs a rating. Be the first to rate this app and get the discussion started!